Nihilist Cheerleader has already made a mark on the Athens/Atlanta music scene over the course of only three years. 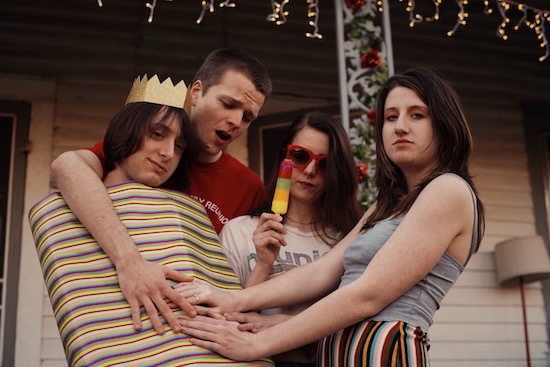 Lyrically, the young foursome focuses on important issues in our present political and social world, connecting with audiences on a personal level. The band’s passion about current concerns make its live shows all that more exhilarating, addressing these problems and allowing listeners to join in on the conversation. Nihilist Cheerleader’s punk/pop feel comes alive not only onstage but also on its records: three singles, an EP and, now, its debut album, Riot, Right? (Perfect Attendance). To support the LP, the quartet is hitting the road this summer for an East Coast tour. First single “Drenched In” discusses the desire to be a child again during these tough times atop a musical foundation that’s both amiable and aggressive. This contrast goes along perfectly with the lyrics, which most listeners will no doubt find a strong, nostalgic connection with. Stream and/or download “Drenched In” below.